Jason Isaacs has revealed that he had a hand in constructing Lucius Malfoy’s send off in Harry Potter and the Deathly Hallows. You can listen to the whole interview here, courtesy of SS, HPANA, and MuggleNet. The Hogwarts Express arrives at Hogsmeade Station as The Wizarding World of Harry Potter continues to develop at Universal Orlando Resort. 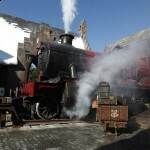 As guests enter Hogsmeade, they will be greeted by the iconic, smoke-billowing steam engine, made famous in the Harry Potter books and films for transporting students to a world of magic and wonder. Opening in Spring 2010 only at Universal Orlando Resort, The Wizarding World of Harry Potter will feature multiple themed attractions, shops and a restaurant. Rhys Ifans, the actor set to portray Xenophilius Lovegood in the Harry Potter and the Deathly Hallows films, recently spoke about his role. Ifans humouresly compared the oppurtuninty to appear in the Harry Potter films as, “[like] getting knighted”. Read the full interview by clicking here.